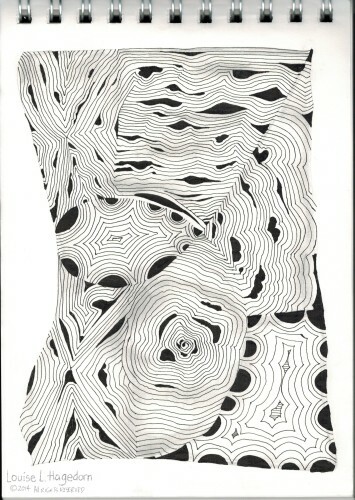 Was looking for some inspiration for doodling and came across Laura Harms’ website on Zentangle. She’s a certified Zentangle teacher who gives a weekly challenge, so I thought to give it a try. I’ve never taken a class, but I find the pattern creation relaxing. This week’s current challenge requires the use of two specific types of tangles, the Crescent Moon and Diva Dance. I see in a lot of posts on Zentangle that they show use disposable felt tipped tech pens. I like that they’re easy to care for, but their disposable nature is so wasteful. I can easily use up one pen less than a few weeks. 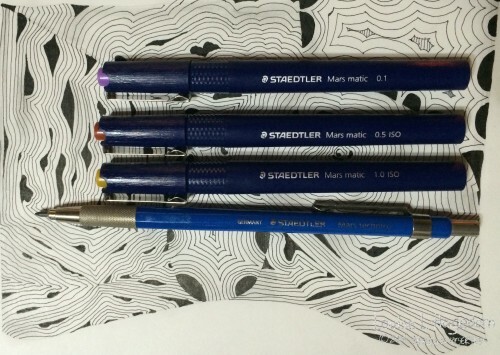 For my drawings, I use refillable Staedtler tech pens. Most of the lines were done using a 0.1mm tech pen. The larger inked areas were done with 0.5mm and 1.0mm tech pens. The additional light shading effects done with a Staedtler clutch pencil filled with HB lead.